“I've always liked that building,” says Rob Goerke. He gestures to a brick industrial structure across Western Avenue, one of the towering, boxy remnants of the 20th century that stud the city. It's almost summer; even though it's after eight, the sun's making pastel glyphs in the sky just behind the building he likes. Later in the evening, he'll be playing bass on the stage of the Empty Bottle as his band Verma celebrate the release of their new LP, Sunrunner. We cross to the building as the last of the day's light drains. I notice that the north-facing wall seems to have been scraped clean of a former attachment—off-color patches of brick indicate spaces where there might have been doors. Now, there's just a fenced-off gravel lot where a few white vans sit parked. Verma line up against the chain link fence. I take their picture. If Verma's music sounds cinematic, that's because they see movies in their head while they're making it. The group began as a scoring project; they'd cut full-length films down to silent shorts and then play music based on the scenes they'd collaged. It didn't take too long for the band to figure out that they didn't need the visual cues to assemble a cohesive mood. They cut the visuals and kept jamming. The heavy psychedelic grooves that populate Verma's discography grow organically out of experiment. “We tend to record all of our practices, and a lot of that is just jams and improvisation,” says Whitney Johnson, who fronts the band on organ, vocals, and viola. “We'll find good stuff and turn it into a song gradually. But it all starts really collaboratively as a jam.” A good fraction of their records, like the self-titled cassette they debuted in 2010, are straight recordings of these improvisations—no engineering. These takes capture Verma's raw energy, but their more refined works, like Sunrunner, which they just released on the local label Trouble in Mind, do a better job of showing off their penchant for story. I'm talking with three of Verma's band members in the practice spot they've always used, a generous space with a little natural light coming through thick glass tiles. It's probably another converted industrial building, built to manufacture physical goods in the 20th century. Now it houses music. Pelts and mounted deer heads decorate the wall of Verma's room. They belong to Zach Corn, the drummer, the only person in Verma with visible tattoos and the first to respond when I ask about everyone's favorite movies. “Mad Max,” he says. I won't meet Johnny Caluya, their guitarist, until he gets back to Chicago for the show at the Bottle. “The panic of isolation,” Corn echoes. Any narratives that Verma had in mind for Sunrunner don't come through in their lyrics, which are obscured past the point of recognition. But Johnson urgently embodies that panic in her voice. On the album's second track, “Chrome”, she duels with Corn's quick rhythms. Her clipped syllables echo. She builds her melody to a holler, then clamps it off with a quick yelp.On the closing title track, she joins her organ in sheets of drone, as if singing from across an unending expanse. I can't hear her words, but I'm amazed at the shapes she makes: abstract, and somehow communicating just as much as language. Goerke and Corn laugh with her. They remember exactly the moment she's talking about. “You were like, 'I can do this forever! '” says Goerke. “We were all pretty amped, and Whitney made us amped, because she was really going crazy,” Corn adds. 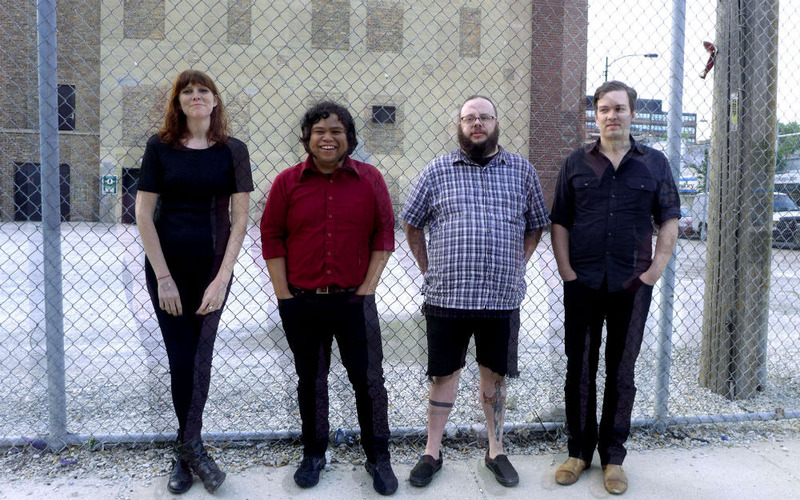 Though they met in Chicago, the members of Verma originally hail from the Southeast. They gravitated to the middle of the country for varying reasons; Johnson moved from the mountains of Pennsylvania when her father, a steel mill worker, followed his job to Gary, Indiana when she was six. She's lived in the Midwest ever since. Corn packed up his stuff and drove out of Pittsburgh to Chicago in search of a better job about six years ago. Goerke, originally from North Carolina, came to Chicago to go to grad school at the Art Institute. A mutual friend, TJ Tambolini, who used to be Verma's fifth member before he moved to Los Angeles, served as the link between the band in their current lineup. He plays guitar and synths, and still features on Sunrunner. Verma live at the Empty Bottle. Johnson leads the mood at the Empty Bottle when Verma start to play under a blood red glow. It's late at night on a Monday but the place is packed with musicians and friends of musicians and the venue's eccentric built-in. Singing behind her Ace Tone, Johnson's presence is magnetic and bizarre. She shakes her head, swings her hair, swivels like a glitching marionette. She pushes huge chords through the keys, or draws a drone out from the strings of her viola. She's the point of focus, the nexus between the room full of people and the enormous, alien music. Beside her, Caluya picks fitfully at his guitar, driving his riffs into distorted tantrums. Corn and Goerke pound out time behind them. People dance. Not mosh, though I see some headbanging, but dance. They coil elegantly around each other. One guy in knee pads and a bandanna, who regularly comes to the Bottle, directs the energy, roping people into his fervent movements. He's a blur of limbs and smile. To his right women bounce with each other. The music's heavy and the mood is not. Watching from the floor, I see that melting down of barriers. I see a looseness between Verma and their spectators, between each of the band members themselves. I look up at Goerke, and his eyes are closed.